Sign up for our weekly inventory update! Our process begins with an evaluation of the vehicle and a review of any known history. Once on the mechanic’s bench we perform any needed repairs, a full service, and a NH State inspection. Then the bike is taken for a test ride to confirm it’s running condition. 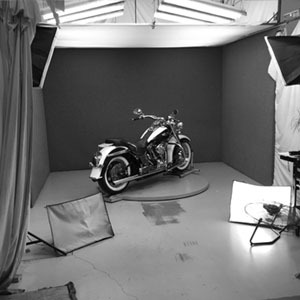 Our 15 step detailing process brings out the best in every bike. People often confuse our used bikes for new ones! We want you to know everything about the bike before you buy! That’s why we provide great photos, a high definition video, and thorough reports. I’m often asked the question “How did you build such a big company so quickly?” Without hesitation, I tell them the secret of our success is our employees. Exceptional business’ start with exceptional people. Our employees are hired not only by their skillset, but also their ability to connect with and serve other people. We work hard to attract people who whom already believe in the company philosophy of “tell the truth”. 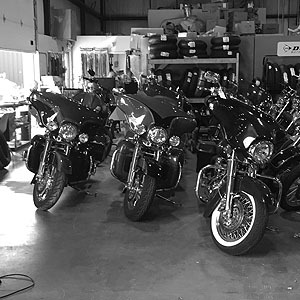 Our hiring process is one of the most comprehensive in the industry, and the result is one of the best crews you will ever encounter in the motorcycle business. All internally lubricated parts; valve covers, intake manifolds; oil pump; fan motor; valves; engine mounts; cylinder head(s); engine block/crankcase and cylinder barrels if damaged as a result of the failure of an internally lubricated covered engine component. Impeller shaft; bearings; bushings and housing. Internal parts; vanes; shafts; bearings, bushings, waste gate and housing if damage is caused by a failure of any of the above covered components. All internally lubricated parts contained within the transmission case: gears: bearings: internal drive gears: internal selector mechanism and transmission mounts. Transmission case if damaged as a result of the failure of an internally lubricated transmission component. (Clutch assembly and cable are not covered). All internally lubricated parts (except clutch and hub assemblies) contained within the primary drive case; all gears; bearings; internal drive gears and chains; internal selector mechanism. Primary drive case if damaged as a result of the failure of a covered primary drive component. Drive Axle Assembly (Shaft driven motorcycles and ATV’s) Differential housing; transaxle housing; final drive housing; all internally lubricated parts of the foregoing; axle shafts; constant velocity joints; universal joins; drive shafts; locking hubs; hub bearings; locking rings; supports; retainers and bearings. Any known documented pre-existing conditions are excluded from this warranty. Full comprehensive extended service contracts are available for many bikes, with up to five years of coverage, please ask for details. This motorcycle is the product of Triumph’s use of proven engineering, exhaustive testing, and continuous striving for superior reliability, safety and performance. 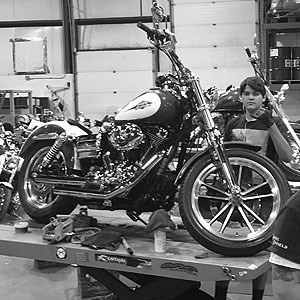 Maintain maximum protection under warranty by ensuring your motorcycle is serviced in accordance with the recommendations of the scheduled maintenance chart in the owner's handbook. The appropriate service record must be stamped by your authorised Triumph dealer. Whenever service, repair or warranty work is undertaken, the motorcycle service handbook must be made available to your Triumph dealer. Within the warranty period, Triumph Motorcycles Ltd warrants the new Triumph motorcycle to be free from any defect in materials used in the manufacture, and/or workmanship at the time of its manufacture. Any part found to be defective during this period will be repaired or replaced at the discretion of Triumph Motorcycles Ltd by an authorised Triumph dealer. Any part replaced under the warranty will be covered for the remaining period of the warranty. Any parts replaced under warranty must be returned to Triumph Motorcycles Ltd by the dealer/distributor and will become the property of Triumph Motorcycles Ltd. Triumph may, at its discretion, make any repairs or replacement of defective parts falling outside the warranty, but such work shall not be deemed to be any admission of liability. Triumph will bear labour charges for work carried out under the warranty. The warranty may be transferred to subsequent owners for the balance of the remaining period. - The machine must not have been used for competition, misused*, inadequately maintained, or incorrectly serviced or maintained. - The machine must not have been subject to any modification, repair or replacement other than as authorised by Triumph Motorcycles Ltd.
- The machine must have been serviced by an authorised Triumph dealer, at the intervals specified in the Triumph Owner’s Handbook and the service log completed accordingly. - Defects caused by faulty adjustment, or repairs and alterations performed by a non-authorised Triumph dealer are not covered by this warranty. - Defects caused by the use of parts and accessories not authorised by Triumph Motorcycles Ltd are not covered by this warranty. - The warranty does not cover the cost of removal and replacement of parts and accessories, unless supplied as original equipment, or recommended by Triumph Motorcycles Ltd.
- The warranty does not cover the cost of transportation of the machine to or from the authorised Triumph dealer, or expenses incurred while the machine is off the road for warranty repairs. - Normal servicing and normal service items, such as spark plugs, oil and air filters are not covered by this warranty. Similarly, items which are expected to wear as part of their normal function such as tyres, bulbs, chains, brake pads and clutch plates are also excluded, unless there is a manufacturing defect. - Front fork seals are not covered by this warranty being subject to wear and tear (particularly stone damage to inner fork tubes). - The motorcycle’s exhaust silencers are warranted for 12 months from the commencement of the general motorcycle warranty. During this 12 month warranty period, internal corrosion or deformation of internal baffles are excluded from the warranty. After this 12 month period, the motorcycle silencers are excluded from the terms of this warranty. Unless otherwise stated, Triumph accessory mufflers do not conform to on-road noise or emissions standards in countries where such standards apply. Use on-road may therefore violate the law. These products are designed for closed circuit competition use only. Triumph accessory mufflers will require a specific tune download, which is available from your authorised Triumph dealer. Specification may vary by market. Some accessories are prohibited by local law. As a motorcycle owner/rider, it is your responsibility to know of and comply with all local laws. If you have any doubt, contact your local authorities. All details correct at time of going to press. Triumph Motorcycles Ltd reserves the right to make changes without prior notice. Please consult your dealer for model and colour availability. - Other items excluded from warranty are seats, luggage, paint, chrome, polished aluminium items, or trim deterioration caused by normal wear and tear, exposure or lack of correct maintenance. - The motorcycle battery is warranted for 6 months from the original date of purchase of the motorcycle. After this 6 month period, the battery is excluded from the terms of this warranty. The battery supplied with the motorcycle must be provided with sufficient charge to replenish that lost by the operation of the starting mechanism and/or the use of electrical equipment whilst the engine is not running. - The warranty does not cover machines used on a commercial basis. - The warranty does not cover defects which have not been reported to an authorised dealer within ten days of discovery of the defect. - The warranty does not cover machines which have been inadequately lubricated, or for which the wrong fuel or lubricant has been used. 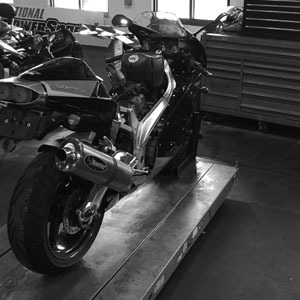 - Should a warranty claim become necessary, Triumph Motorcycles Ltd and its Authorised Dealers shall not be liable for loss of use, inconvenience, lost time, commercial losses or other incidental or consequential damages. Motorcycling will be enhanced by the knowledge that your machine is being serviced to the high standards demanded by Triumph Motorcycles Ltd. Your motorcycle may require more frequent servicing if operated in severe climates or conditions, or if used for short, stop/start journeys. Further information can be obtained from your authorised Triumph dealer. The first service must be carried out at 500 miles/800 kilometres/1 month, whichever comes first.